My favorite aspect of my work as a decorator--besides working with fantastic clients of course--is interior redesign. I love reinventing a room using only what people already have in their homes. It's a great creative challenge, and in my opinion, the resulting room is more personal and interesting than it would be on an unlimited budget. 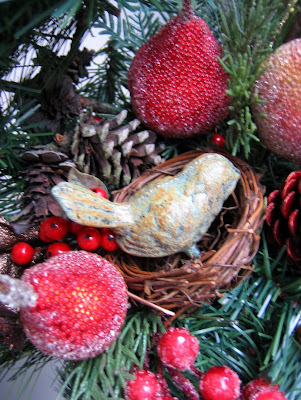 My love of reinvention came in handy as I unpacked my Christmas decorations this year. I was wondering what to put on the chalkboard table on our front porch when I came across an 8 inch candle wreath that I had never really liked. It was too thin and skimpy, and it had never had enough "oomph" to really earn its keep as a decor item. Then I spotted an urn that I had bought for $1.50 a few years ago at the Habitat for Humanity store. Speaking of decor items that earn their keep, urns really do earn their keep ("urn" their keep?) --they're so versatile, and they work well in both traditional and contemporary settings. 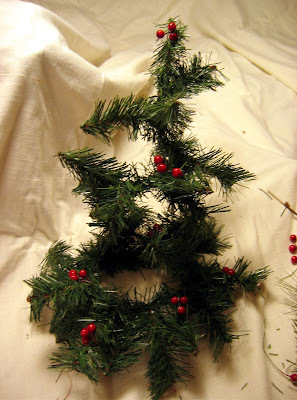 It occurred to me that I might be able to twist the wreath into a spiral and use that as the framework of a topiary. 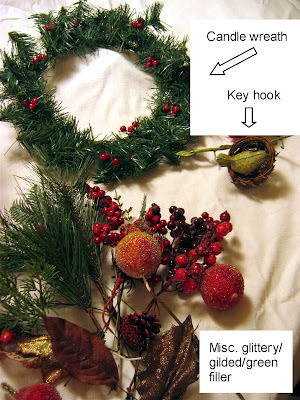 I gathered some supplies: the urn, the candle wreath, a bundle of silk greenery, faux berries, gilded leaves, and glittery fruit/cones, as well as a key hook fashioned as a bird in a nest. 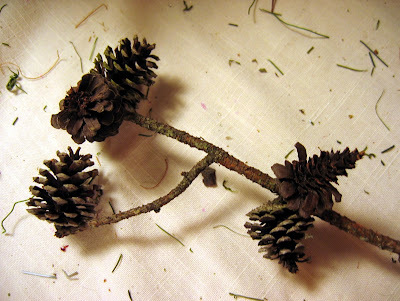 I also grabbed some tiny pine cones that I had picked up on a neighborhood walk. I figured they'd be easy to work with because I could keep small pieces of sticks attached to the cones to anchor them in place. 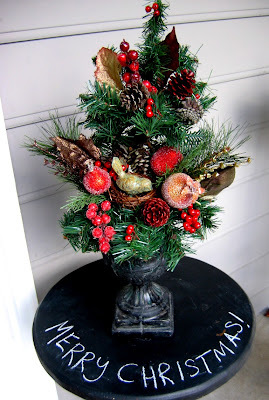 I'm sure that I violated some floral arranging rule that says I can't mix ordinary pine cones with red glitter cones in the same arrangement, but the floral police don't intimidate me. What are they going to do? Jab me with a corsage pin? I'll take my chances. 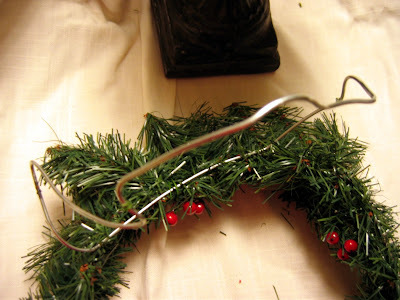 The green portion of the wreath was made of a soft, bendable wire, but it was tied onto a stiff wire ring. I started by separating the greenery from the wire ring. This gave me orthodonture flashbacks, but I forged ahead. Anyone else ever have to wear neck gear in middle school? Medieval. 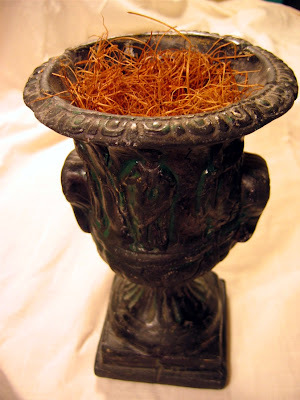 To secure the spiral to the urn, I just poked the end of the wire into some moss in the base of the urn. Then I tucked greenery, fruit, and gilded leaves here and there until I was satisfied with the overall shape of the topiary. No hot glue required! I'm sharing this in the hopes that it will inspire you to look at your decor items with fresh eyes this season. When you see them as ingredients instead of finished products, the creative possibilities are limitless! This project has been posted with other great DIY projects at Finding Fabulous, The Shabby Chic Cottage, Today's Creative Blog, Reinvented, & A Soft Place to Land.